In March I finally decided to stop relying on internet hearsay to answer my legal questions and starting writing letters to the ATF seeking clarification on the murkier points of firearms law that are often (and often endlessly) debated on the net, usually without supporting documents. I received my first reply over the weekend, to a letter seeking some general clarifications on 922r issues, and was, for the most part, pleasantly surprised with the response I received. I expected something much more vague, and possibly evasive. Some of it was even sensible! There are several interesting points in there. First, there it is in black and white that 922r applies to assembly, not mere possession, and that routine mainenance, inserting and removing magazines, et cetera, is NOT assembly for 922r purposes. I don't think their first answer (that "assembly" means what it normally means), makes sense in this light, since if I took apart a gun and put it back together, I would say I had assembled it. Nonetheless, I am glad to have this letter in my file for that reason alone. Second, less positive, if I change any parts, I have assembled the weapon. That's bad. If a spring breaks and I replace it, suddenly I am responsible for 922r status? I may write for further clarification on the kinds of changes which would and would not constitute a new assembly of the weapon. Some make sense, such as replacing a thumbhole stock with a pistol grip, but some do not, like replacing a broken part with a new, identical one. Third, I was very interested to read that the burden of proof lay on the government. I have read exactly the opposite with regard to 922r on the net, supposedly posted by an attorney. I do not recall the details and cannot find the post, but due to some contortion of law, it was claimed that the burden of proof in the case of a 922r violation lay on the defendent. Can anyone shed more light on this? I would like to hear the argument to the contrary so I can be specific if I write for clarification. I consider 922r absolutely unprovable beyond a reasonable doubt, and very difficult to prove even by a preponderance of evidence, so it is critical upon whom the burden of proof lies. Finally, as expected, there is no standard procedure to determine origin of parts. So...thoughts? Especially regarding burden of proof. I am definitely going to write back for further clarifications on what kinds of maintenance constitute assembly and which do not. I would also like to address the burden of proof issue, but I can't do so without knowing more about it. As I've said before, there's a reason why no one's ever heard of a 922(r) prosecution/conviction. If the feds really, really wanted to nail someone, and were willing to throw enough time and energy at it, they might be able to make a halfways convincing case in court...but to get to that point there would need to be a pressing political purpose driving the issue. I've personally seen FBI/ATF go to impressively thorough investigative ends to nail someone on non-922 weapons charges..but they were clearly motivated by political pressure, and the suspects had already been charged with far more serious crimes. The weapons charges were merely a backup in case the primary case fell through. Given essentially unlimited time and energy could ATF Tech Branch or some other equivalent "prove" that certain parts were beyond-a-reasonable-doubt foreign-made? *Maybe*. With enough metallurgical comparison testing, foreign-sourced samples, etc, it might be possible. Are they going to waste that much time and money on some random dude with a homebuilt FAL shooting at the local range? I've got better odds on winning the lottery in three different states simultaneously. Unless you were retarded enough to clearly document that you were assembling an non-sporting firearm from foreign parts, post it onto Youtube, and attach your contact information, then you're probably safe. If importers like Century started cutting corners, someone would eventually notice, and ATF might get involved-big fish attract bigger attention. Homebuilds? Not likely. Great post, thanks for doing the work on this Malik! They didn't specifically speak to the "insert the magazine" question. I did notice that omission. I am going to address it in a more general way in my reply, getting to the issue of when replacement of parts is assembly and when it isn't. I know these letters are hardly ironclad protection against anything. If the ATF wants to ruin your day, they will, whether the actually convict you or not. BUT I would rather have some evidence that I tried to determine what the law is and follow it, than have to say, "I read on the internet that this was legal..."
I am not planning on playing with fire on this, btw. All my "assault weapons" have the right number of US parts, clearly stamped as such. Last edited by N4KVE; May 03, 2009 at 23:45. I am writing for clarification on Title 18 § 922(r), which prohibit s any person “to assemble from imported parts” some semiautomatic rifles and shotguns under certain circumstances. The meaning of “from imported parts” is defined in 27 C.F.R. Section 478.39 as being not more than ten parts of foreign origin from a list of twenty possible parts. However, there is no requirement that the origin of any parts, whether of foreign or domestic make, be marked on these parts in any way, with the exception of the receiver. Therefore almost all firearm parts other than the receiver are not marked with regard to national origin. When considering the purchase of a second-hand semiautomatic rifle or shotgun, it is often impossible for the buyer, or any other party, to determine with any certainty the origin of the parts of the weapon. By extension, it is often equally impossible for the potential buyer to determine whether or not the rifle or shotgun is in compliance with § 922(r), based on the standards set forth in 27 C.F.R. Section 478.39. Firstly, what is the BATFE’s definition of “assembly” as it applies to § 922(r)? Secondly, does the BATFE consider routine maintenance such as the removal and replacement of parts for cleaning, or the removal and insertion of magazines to constitute “assembly”? Thirdly, would a person incur criminal liability by the purchase and possession of a second-hand firearm which was determined not to be in compliance with § 922(r), even though the assembly of said firearm was performed by someone other than the buyer, and the buyer had no way to verify the legality of that assembly? Fourthly, if a person were to be criminally charged with a violation of § 922(r), on whom would the burden of proof lie, and what standard of proof would be required to establish guilt or innocence? Finally, what is the BATFE’s procedure for determining whether a given firearm is in compliance with § 922(r), given that the absence of a mark indicating the origin of a part is insufficient to draw any firm conclusion about the part’s origin, foreign or domestic? 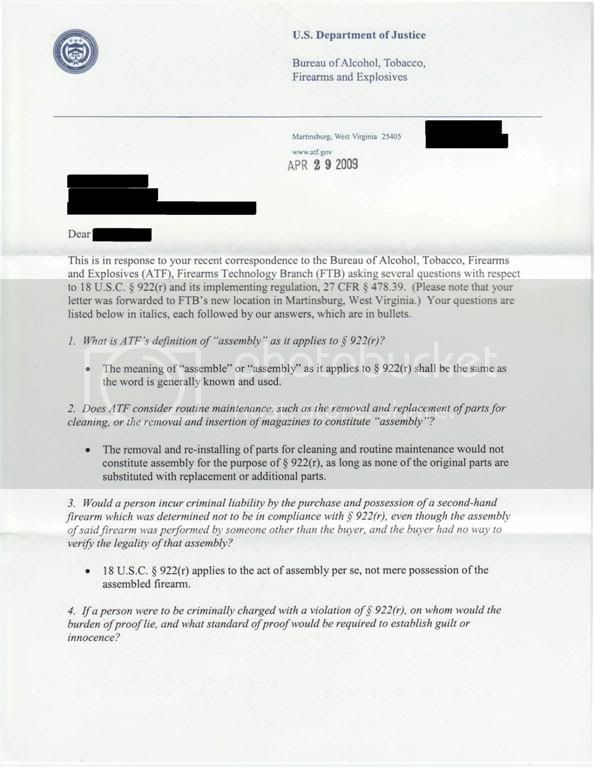 This is in response to your recent correspondence to the Bureau of Alcohol, Tobacco, Firearms and Explosives(ATF), Firearms Technology Branch (FTB) asking several questions with respect to 18 U.S.C. 922(r) and its implementing regulation, 2TC FR 478.39. (Please note that your letter was forwarded to FTB's new location in Martinsburg, West Virginia.) Your questions are listed below in italics, each followed by our answers, which are in bullets. 1. What is ATF's definition of "assembly" as it applies to 922(r)? The meaning of "assemble" or "assembly''as it applies to 922(r) shall be the same as the word is generally known and used. 2. Does ATF consider routine maintenance, such as the removal and replacement of parts for cleaning, or the removal and insertion of magazines to constitute "assembly"? The removal and re-installing of parts for cleaning and routine maintenance would not constitute assembly for the purpose of $ 922(r), as long as none of the original parts are substituted with replacement or additional parts. 3. Would a person incur criminal liability by the purchase and possession of a second-hand firearm which was determined not to be in compliance with 922(r), even though the assembly of saidfirearm was performed bl,someone other than the buyer, and the buyer had no way to verify the legality of that assembly? 18 U.S.C. 5 922(r)a ppliest o the act of assembly per se, not mere possession of the assembled firearm. 4. If a person were to be criminally charged with a violation of $ 922(r), on whom would the burden of proof lie, and what standard of proof would be required to establish guilt or innocence? guidance of legal counsel for a detailed explanation of this standard. 5. What is ATF's procedure for determining whether a given firearm is in compliance with 922(r), given that the absence of a mark indicating the origin of a part is insufficient to draw any firm conclusion about the part's origin, foreign or domestic? review must be taken on a case-by-case basis and may necessitate evaluation of such things as: design characteristics, markings (or lack thereof), and associate documents and/or statements. We thank you for your inquiry and turst you find our answers responsive. 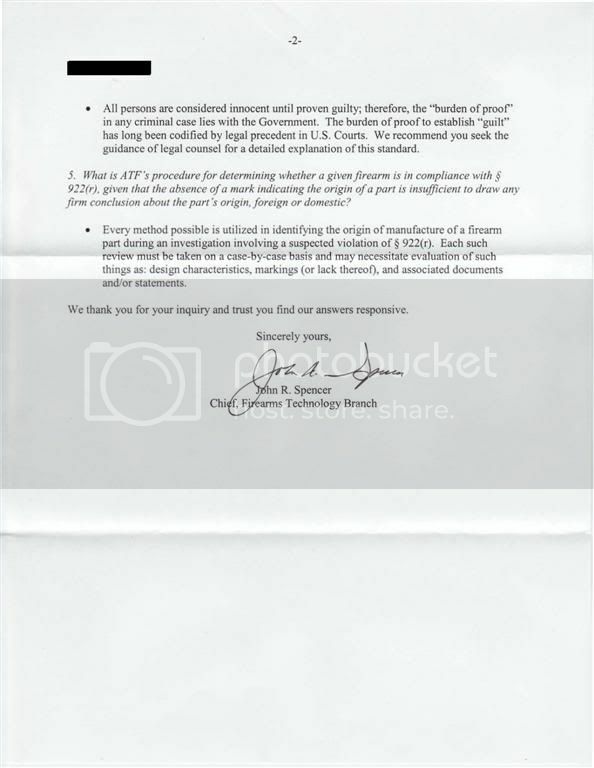 ATF's reply is a little mangled, since I OCR'd it rather than retyped, but the key words are there. "Second, less positive, if I change any parts, I have assembled the weapon. That's bad. If a spring breaks and I replace it, suddenly I am responsible for 922r status? I may write for further clarification on the kinds of changes which would and would not constitute a new assembly of the weapon. Some make sense, such as replacing a thumbhole stock with a pistol grip, but some do not, like replacing a broken part with a new, identical one." prosecutor wanted to be a jerk. "Here it is folks, if the gun was purchased 2nd hand in good faith, then we are not responsible for the correct amount of US parts, since we didn't import or assemble the gun." Well, maybe. If BATF ever has reason to take a close look at one of your non-compliant rifles they may not prosecute your for 922r violation but I really doubt that you ever see your rifle again. The other issue you should all think about is that you don't have to be guilty of anything for them to turn your life upside down and force you to spend a ton of your money on legal fees. Clearly marked US parts are very cheap insurance against stupid and expensive litigation. As a newly "Reformed" 922 NAZI , I hereby offer NO opinion on the matter at hand. I seem to have been an "enabler" to a government which doesn't seem to really know or maybe even care what regulations it has authored and are supposed to enforce. I will henceforth steer my own path, follow my own conscience, and leave you folks to your own devices in such matters. Thank you for so eloquently presenting the issue N4KVE. Any problems ? Well, don't call me. That quote reads like someone took "The Emperor's New Clothes" and just gave it a bit of a twist and modernized it. As in the kid ? with the revelation about the Emperor being naked gets omitted. And EVERYBODY follows the Emperor's bold new fashion statement. Sort of like Hollywierd. Or, maybe Washington. Seems to me that that is exactly what we were telling you. Clear as Cook County mud. There is a LOT of discussion of 922(r) because it is very ambiguous. To summarize, I posted this in parallel thread and think it sums up the 922(r) issue. 1) It only applies to assembly. HOWEVER, the BATFE defines assembly as changing a minimum of ONE part. NOTE: Removing and inserting a different magazine does not mean assembly per the BATFE. 2) There is no criminal penalty for possessing a 922(r) non-complaint rifle. HOWEVER, the BATFE has not ruled whether a non-compliant rifle is contraband subject to confiscation. 1) Those of us that think it is cheap insurance against the whims of the BATFE. Not to mention keeping a market going for US craftsmen. 2) And those that think it is a waste of money because there is no enforcement built into the law. Therefore the odds of you having an issue are about the same as being mauled by a polar bear and a grizzly bear in the same day. Those are the risks you have to weigh for yourself. Anyone that says, "ignore it, it is not an issue", is being disingenuous because this is a poorly defined area and they really don't know. No one knows. There are some definitively correct answers, and a LOT of gray-area ones where some answers may be more correct than others. With any gray area you have to weigh the facts and risks for yourself to see what fits for you. As for parts being labeled, there is no requirement in the Law for parts to be labeled, you may or may not be able to readily tell. One answer is to keep receipts, with the receipts for the compliance parts (or most of them), a reasonable person could assume they are present and doubtful anyone would challenge that. Moreover, just how is it the 89' ban on imported assault weapons does not violate our entry/participation in the WTO? Visit Be Ready or Die! 's homepage! Find More Posts by Be Ready or Die! Anyone who's been in or around the business for any length of time, will have a story about someone who was unfairly prosecuted by the BATF. That doesn't mean they did anything wrong, just the Govt. thought they had. Remember, the BATF is part of the Dept. of the Treasury, the same folks who brought us the IRS and their easy to understand tax regulations. Some of the firearms regulations are, as they say here in the South, "Clear As Mud". The '89 Import Ban governs our requirement for no more than 10 imported parts on "sporting" weapons. However, since an NFA weapon, in this example an SBR, doesn't need to meet the sporting criteria, the parts count can be ignored. So if your cost of domestic parts will exceed $200, it's cheaper to pay the tax and build it as an SBR. The law is clear about how to legally destroy an NFA receiver, but not what to do with a Title I receiver. If the customer's AR-15 goes Kaboom, and the lower is destroyed, and you replace the weapon, what happens to the old receiver? If you just give the destroyed receiver to another dealer, to strip the parts, and they proceed to repair it and covert it to an illegal M-16, are you responsible? I had a friend spend $10,000 in legal fees in Federal Court to find out the answer. He was found innocent, but he could have saved himself a lot of trouble by either torching it himself or giving it to the local ATF office. I can keep going, but I think you'll see my point. None of this was written in the law, it was done through interpretation of the bills signed into law. A written opinion from the BATF does NOT have the force of law, and may be changed without notice. It might become part of your later defense, but it probably won't keep them from charging you if they desire. Ultimately, it's not the opinion of a lawyer, or the Government's interpretation of the law, that will matter, it's what the 12 reasonable people sitting on the jury think. As a cop having testified in Municipal, County, District and Federal courts I can tell you that the 'Burden of Proof" ALWAYS lies with the government. Only in civil litigation does "Perponderence of the Evidence" come into play. In ANY criminal case the government HAS to prove BEYOND A REASONABLE DOUBT the guilt of the accused. When they come knocking down your door, 922r will be the least of your concerns. "You may beat the rap, but you won't beat the ride.."
Scarred for life. Damaging to your mind body and soul. The ride is more than it would seem.